Elahe Rahimi, an Iranian asylum-seeker who fled the notorious depredations of the Islamic Republic, suffers severe consequences of diabetes, including among others complete renal failure and ischemia of her lower extremities. As can be seen from the attached images, the progression of gangrene in her feet over the course of 6 weeks without appropriate medical care has been significant. 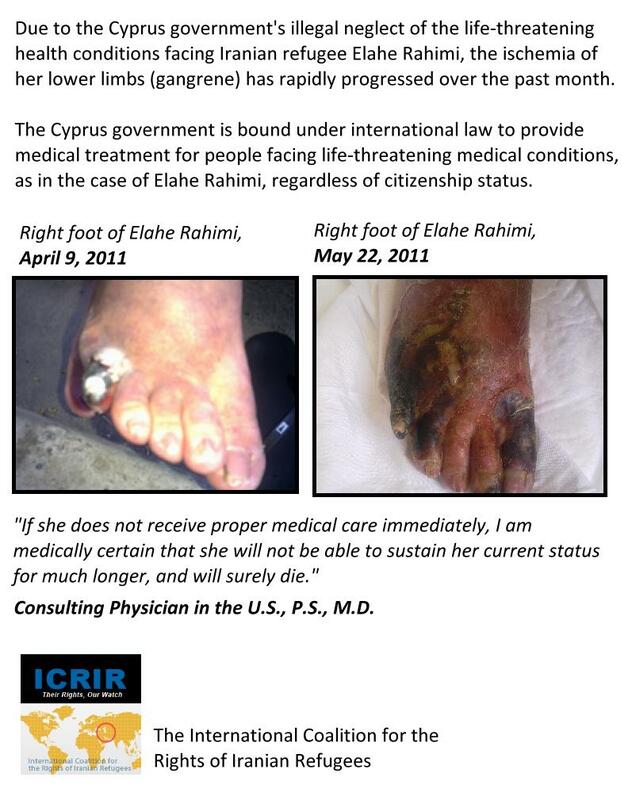 As a result of the refusal of the Cypriot government to provide timely and appropriate care for Mrs. Rahimi’s gangrene, she is now at risk for necrotizing fasciitis, according to her consulting physician in the United States, which will result in Mrs. Rahimi dying a horrific death within one week of the ascending infection. Note that her current condition has been deemed “not urgent,” and thus Mrs. Rahimi has been denied even emergency care on this basis. Further, although Mrs. Rahimi has been prescribed medication and is at this moment in the hospital (though at high risk of being sent home), the hospital will not fill the prescriptions. Instead, the family is forced to try to find the money to purchase the very expensive medications and buy them outside the hospital and bring them back to Mrs. Rahimi to take. 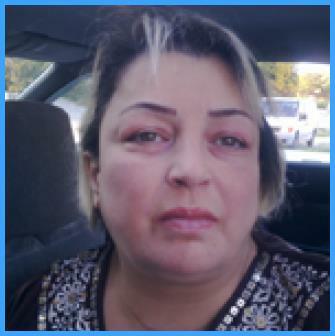 The family cannot afford the medications necessary to keep Mrs. Rahimi alive. 1) Under the 1951 Convention and the 1967 Protocol relating to the Status of Refugees, Mrs. Rahimi has a guaranteed right to asylum, which has been denied through the draconian refugee status determination practices in Cyprus that result in a refugee recognition rate of only about 1 percent. What this refugee recognition rate guarantees is that in Cyprus, nearly all asylum-seekers, including Mrs. Rahimi, are denied their internationally-recognized right to asylum. 3) When UNHCR staff was asked, given this emergency, what UNHCR could do to help, the reply was, “Nothing.” UNHCR-Cyprus staff advised that Mrs. Rahimi should simply return to Iran to obtain health care there. For a UNHCR staffperson to make such a suggestion, given the repression in the country and given that the Islamic Republic regime has promised to prosecute returned asylum-seekers, is unconscionable. The UNHCR staffperson was told, “She can not return which means that she stays here and dies,” to which the UNHCR staffperson replied only “with a meaningful smile,” according to a family member of Mrs. Rahimi. Mrs. Rahimi has faced violation after violation of her human rights and her rights under international and EU law. It is unacceptable and we demand that these violations stop now. We request that the European Court of Human Rights urgently direct the government of Cyprus to provide Mrs. Rahimi full and unfettered access to appropriate health care. Further, Mrs. Rahimi has a right to asylum, and this right should be immediately granted by Cyprus. The European Union should urgently investigate the practices regarding refugee status determination and illegal refoulements in Cyprus. If Cyprus cannot bring its standards of performance in the area of human rights up to the level demanded by the European Union, we suggest it be considered for expulsion. (1) Note that this case has implications for most asylum applicants in Cyprus, which has a refugee recognition rate of approximately 1 percent, among the lowest in the EU. – Article 4 of the European Union’s Charter of Fundamental Rights prohibits torture and inhuman or degrading treatment or punishment. Allowing a person to be consumed by gangrene because she is a denied refugee and cannot afford to pay is indeed both torture and inhuman and degrading treatment. It is illegal under the EU Charter of Fundamental Rights. discrimination, especially the most vulnerable or marginalized sections of the population, in law and in fact, without discrimination on any of the prohibited grounds. – Article 24 of the Convention and Protocol relating to the Status of Refugees also refers to the minimum standards that should be applied to all refugees seeking asylum: The Contracting States shall accord to refugees lawfully staying in their territory the same treatment as is accorded to nationals in respect of the following matters: Social security (legal provisions in respect of employment injury, occupational diseases, maternity, sickness, disability, old age, death, unemployment, family responsibilities and any other contingency which, according to national laws or regulations, is covered by a social security scheme).